At each six monthly visit, I routinely check your cat’s teeth and gums. If any problem areas can be seen I can advise you on what can be done at home to improve your cat’s dental issues and in the event the disease may have advanced beyond what home care alone can manage, I can suggest the best way forwards. Veterinary dentistry is now a specialized field in its own right. That said, the vast majority of dental procedures can be managed without referral. When we go to the dentist ourselves our teeth are scaled, polished and careful assessments are made about whether xrays and extractions are required. All this is recorded for future reference. This level of service is available for your cat too. Specialized dental instruments and even xray machines are becoming more mainstream at veterinary practices and provide the ultimate level of care for your cat's teeth. You can be reassured that I also have the expertise needed to advise you on the best way to get your cat's mouth back to a healthy state that you can then manage at home. With 70 percent of cats showing signs of oral disease by three years of age, dental hygiene and regular vet checks are vital to ensuring you cat lives a pain-free and healthy life. Smelly breath (halitosis) is often thought to be a fact of life but in reality it is one of the first signs of dental disease. Dental disease doesn't only affect your cat’s mouth and cause discomfort, it can lead to bone loss and other serious health problems. Pockets of infection can bleed during chewing, allowing the bacteria to enter the blood stream, which can lead to heart, lung and kidney disease which is another reason regular dental care is so important to every cat’s health - it is definitely not just an older cat problem. Here are some signs to look for when checking your cat’s mouth. Why is it best practice to xray your cat's teeth during each dental procedure? Reassure us that each tooth's roots and bony support structure is healthy. This helps us to monitor (rather than extract) any suspicious looking teeth. Allow a complete assessment - in cats, often the tooth crown (the bit we see above the gum line) can look healthy, but lurking underneath, the roots can be diseased meaning the tooth actually needs extraction. Even with the most co-operative cat, it is impossible to assess every surface of every tooth without an anaesthetic. Many cats have large accumulations of tartar on their teeth which can mask any underlying tooth and gum disease. Develop the right treatment plan for each cat. As well as assessing the full extent and severity of the disease xrays help in the decision making process as to whether a tooth needs extracting or not. Screen cats with missing teeth or those that have had extractions for any traces of residual tooth roots -these can be a potential future source of pain/infection. Domestic cat teeth are extremely fragile and diseased or older cat's teeth even more so. Teeth can therefore break very easily during the extraction process so post-extraction xrays can be a good idea if there is any doubt that some tooth remains. How can I help to keep my cat's teeth clean & reduce the risk of dental disease? 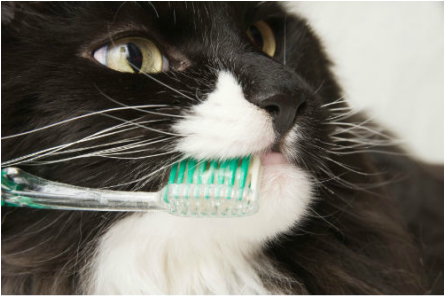 ​Brushing your cat's teeth (believe it or not) can be achieved. Granted it is impossible with many but like anything if your cat is exposed to something in a positive way from an early age it can become a normal part of their healthcare. Always use a veterinary toothpaste which is safe for cats. You can even get some benefit from just wiping your cat's teeth with the paste as it contains special enzymes to help breakdown the bacterial film on the teeth. Many dry foods and even some treats claim to help with "oral care" and "dental health" but their efficacy is significantly less than these scientifically proven prescription veterinary foods. Any "treats" have more of an expansive effect on your cat's waistline than they ever do on preventing dental issues in my experience. *NB: Always take the advice of your usual vet when introducing other foods or supplemental products as they can interact with other illnesses/treatments that your cat may have. What is the most common dental problem I see during my home visits? Other than excessive tartar and gingivitis, the most common dental condition I see is Feline Odontoclastic Resorptive Lesions (FORLs). Sometimes you will hear this referred to as "neck lesions" or odontoclastic resorptive lesions. Regardless of the terminology used, they describe the same condition - a pathological process that starts in the tooth root and results in destruction of the rest of the tooth's structure. Xrays are particularly necessary for cats with Feline Odontoclastic Resorptive Lesions. The initial tooth root changes are only detectable using xrays. For this reason routine mouth checks during a checkup consultation will not detect very early lesions, but they will detect the condition once it has spread to the parts of the tooth above the gum line (the tooth "crown"). This may appear as a pink spot or later on an area of red gum tissue growing over the tooth crown. If left long enough though, parts of the crown will actually erode away or entire teeth can be missing altogether. 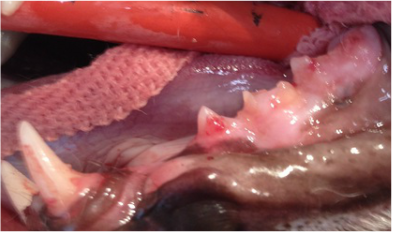 Have a look at the comparison photo (left) showing a cat with normal teeth and then a cat with teeth with FORLs at varying stages of the disease process. Even though 1 in 4 cats suffers from FORLs, it remains unclear why the lesions occur. We do know from humans with the same condition that it can be a painful process. Don't forget that cats are masters of hiding pain from us which usually means that these tooth lesions need to be treated by extracting the affected teeth sooner rather than later. Open tooth lesions like FORLs are also a route for bacteria normally resident in the mouth to access areas deep within and around the affected teeth. This can lead to tooth root infections (abscesses) and even septicaemia once the bacteria enter your cat's bloodstream. 4 year old cat with advanced Feline Odontoclastic Resorptive Lesions (FORLs) - only remnants of teeth remain. All these teeth required extraction and his owner reported he was "like a new cat" afterwards! If done properly, veterinary dentistry under general anaesthesia is often a long and delicate procedure that requires particular attention to pain relief. The extent of dental disease can be very difficult to establish until the individual cat is under anaesthetic. In some cats it is necessary to stage dental extractions on two separate occasions. For all these reasons dentistry can be a potentially costly process. I often give a best/worst case scenario range when estimating dentistry fees to try and prepare owners as much as possible. Please note: Many vets still do not take xrays before performing extractions and this can lead to wide variations in estimates given. Always ask whether the dentistry fee includes xrays and if not, consider finding a vet that does provide this level of care. Many pet insurers do not cover dentistry. I always advise cat owners to take out a pet insurance policy that covers more than dental injury alone to avoid future shocks with dentistry costs.